Our end-to-end solutions include designing, building, and installing a wide variety of systems that meet the needs of nearly every market sector, including commercial and financial services, technology, and more. We have self-performance capabilities and are certified/registered for multiple trades, including general construction and mechanical and underground utilities/excavation. 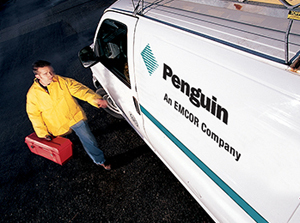 From commercial HVAC repair to building automation systems services, we have the tools and experience to deliver exceptional results. We offer extensive construction management expertise. By communicating effectively and continuously tracking schedules and budget details, we consistently complete our projects, including commercial electrical services, on time and on budget. Our in-house BIM/3-D CAD capabilities help minimize field errors and conflicts while maximizing prefabrication opportunities. In addition, as part of EMCOR, we have access to over 300 fulltime 3-D and BIM-enabled detailers. Regardless of your project’s size or complexity, we can deliver it better and faster than before. Contact us to learn more about any of our services or to begin the process of designing a customized preventative maintenance program.